Lately, I’ve spent a lot of time talking about pension risk transfers. I think it’s market that can explode over the next 12-18 months for any financial professional who is committed to talking to CEOs and human resources leaders. But, saving on premiums and taking a less valuable employee benefit off the table is only part of the benefit. The real benefit is the shifting of risk. Plan sponsors bear several risks that can be reduced or eliminated. 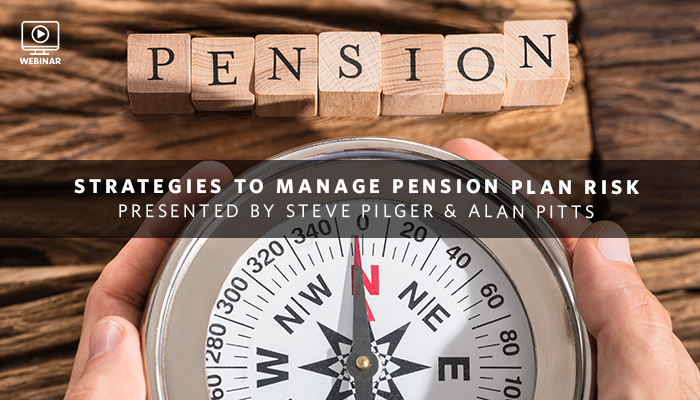 Pension plan sponsors take on the investment risk of plan assets. Regardless of economic projections, managing risk will likely be more difficult within a plan for the immediate future. Rising interest rates will result in lower bond valuations. A choppy market will make it difficult to have steady returns necessary to hit funding targets. Life expectancies continue to increase in the United States. There is a requirement to pay the monthly income stated in the pension plan document. Regardless of how long the plan participant lives, the plan must meet that obligation. The problem is that the current funding status for many plans is below 100 percent, so the plan might not have enough assets to meet those obligations. The same problems exist for most retirees. They ask, “Do I have enough assets to generate the income that I need? And, will I live too long and exhaust those assets?” Unfortunately, business owners and leaders must answer that question for themselves, as well as for all their employees. The fact that business owners have an added responsibility for their employees’ retirement creates more stress and anxiety. These risks can be shifted through pension risk transfer. The process can be cost effective. It’s long, but it can be easy and seamless for business owners. There is little reason to keep risk on your balance sheet when there are alternatives. Unfortunately, most business owners don’t know about the options available to them. It makes a great conversation for you to have with business owners: Shift this risk, and you will gain the trust of the entire company. Shift the longevity risks for corporations in a similar fashion to individual retirement plans. Take away investment risks and the potential of living too long, and you’ll gain a corporate client plus all the employees. Watch the replay of our webinar where we talk how pension risk transfers can be an effective tool for defined benefit plan sponsors seeking solutions for rising costs and longevity risk. I can never resist talking basketball in the spring, especially around the NCAA tournament and the final stretches of the NBA season. For anyone who knows me, my recreational basketball skill set is focused on offense, not defense. Specifically, my game is played between the two 3-point lines. I usually don’t leave a game thinking I should have taken a shot but didn’t. A lot of coaches tell players that they will never make the shot that they don’t take. Recently, one of my best wholesalers posed a question to the rest of our sales team. He asked how often clients wish they had bought something a year ago but didn’t have the faith to make the decision. Think about how many people wish they had bought a few years ago. And, think about how many had wished they sold it while it was at an all-time high. That’s always the case – clients always wish they had done something a year ago. So here’s my question: What will you wish you had done this year when you look back at your business next year? Current tax law allows companies to make deductible contributions to their 2017 pension shortage at the higher tax rate of 35 percent. This equates to a 14 percent discount for applying contributions to the pension shortage in 2018. With our recent strategic partnership, Ash Brokerage can provide fee income to financial advisors before product is placed and while the company completes the termination process. More and more large companies are taking advantage of shifting pension risk to insurance companies. Small and midsized companies tend to follow larger corporations, and most pension assets rest with small businesses. Bond yields will likely change dramatically over the next 36 months, putting pressure on the fixed income portion of the investment portfolio. The same can be said for the recent volatility in the equity markets. It makes it difficult for plan sponsors to manage the risk for investment yields. Life expectancies continue to increase for older workers. That puts more obligation on the plan assets to provide lifetime income to the plan participants. That translates into more risk for the plan sponsor. Economic and tax climates make it a great time to talk about pension risk transfers. If you don’t begin integrating it into your practice today, you will likely look back a year from now and say that you wished that you done so. Don’t be wishing you had done something a year ago that is now costing you business. Take a good look at pension risk transfers as a larger part of your business. Don’t look back a year from now and wish you had added pension risk transfers to your business. The climate is ripe to take advantage of a business opportunity that might not come by again. Our sales team talks with a lot of advisors over the course of our travels. Most conversations center around the need to grow the advisor’s business. As I’ve discussed before, part of The Go-Giver philosophy is the Law of Compensation: Your income is determined by how many people you serve and how well you serve them. Deploying this law through pension risk transfer sales can help you drive your firm’s revenue and increase the number of people you serve. Pension risk transfers will be a significant market over the next decade. For advisors, it’s a great way to meet new prospective clients through a business contact. It opens the door to a group of employees with the approval of the employee’s human resource department or company’s leadership. What a great introduction to new people! Pension risk transfers create a win-win-win scenario for the advisor, the employer and the employees. The employees gain the advantage of talking to a retirement expert on-site, which is viewed as an added benefit at no cost to the employer. The employer gains the ability to transfer their risk to an insurance carrier, and eliminate or reduce the risks to their balance sheet and cost structure of maintaining a pension plan. The advisor wins by helping more people and serving them better, which is the basis of the Law of Compensation. Help more people and help them with their most complex problem – retirement. You can do both by working in the pension risk transfer market. Throughout my sales career, several mentors told me the catch phrase, “Cost is only an issue in the absence of value.” Of course, I usually hear that and think about it from my perspective. It’s always important to add value to your business and personal relationships. But, when you talk about the added benefits of guaranteed income, you have to offset the cost with value. In many cases, the value of guaranteed income far outpaces the cost associated with the purchase of the vehicle to provide the guarantee. Now, it’s important to convey the same message to clients and not just sales teams. Specifically, we need to talk to company CEOs and human resource directors about the risk of their pension plans. Those are real increases and real dollars that will be spent on an employee benefit that is not being leveraged to the full extent. So, the question is: Why would a company have a benefit that is going to increase in cost but doesn’t provide any benefit? I doubt any CEO would invest in a new plant or machinery that didn’t have a suitable return. Especially with human capital, companies are reluctant to invest in additional funds without a plan to grow production through that investment. They shouldn’t do the same thing for an expensive employee benefit that is not providing value. The cost of additional contributions is expensive. Life expectancies have increased and returns are much lower than many old plan assumptions. Both of those result in funding shortages for a lot of defined benefit plans. Currently, CEOs are faced with making large contributions to bring the plan up to proper funding status. Since many are not willing to do that, they are left with the same problem year in and year out: an underfunded pension plan not benefiting the organization. Well, it’s about to create more of a drain due to the cost increases from the PBGC premiums. Myths exist around pension risk transfer business. Many believe that a company has to write a huge check to cover their shortage. Instead, in many cases, it makes sense to stagger the plan termination over a period of several years. Cash flow and capital requirements might make it easier to have a 5-10 year strategy instead of a one-time contribution. Another myth is that lump-sum distributions don’t help. In reality, lump-sum distributions can make a difference in the amount of shortage. Having educational meetings with employees can help the engagement level of lump-sum distributions. That’s where a good income specialist can benefit the employee base. Retirement remains the most complicated problem most Americans will face; our industry needs to be face-to-face with as many people as possible. Take the cost of the least valuable employee benefit off the table for companies. In doing so, you can help a greater number of people retire more securely. Watch the replay of the webinar where we talk how pension risk transfers can be an effective tool for defined benefit plan sponsors seeking solutions for rising costs and longevity risk.